VALCOURT, QUEBEC, CANADA – June 27, 2018 – (Motor Sports Newswire) – Can-Am ATV and side-by-side vehicle racers earned numerous podiums and class wins in two different series this past weekend in Missouri and West Virginia. 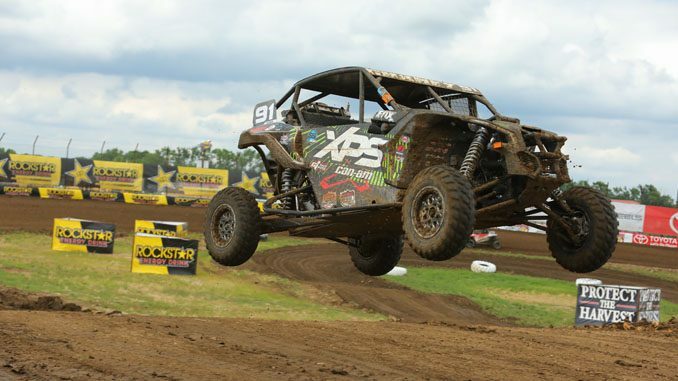 The side-by-side vehicle pilots earned two podium sweeps in the Turbo Production UTV class at rounds four and five of the Lucas Oil Off Road Racing Series this past weekend in Wheatland, Mo. 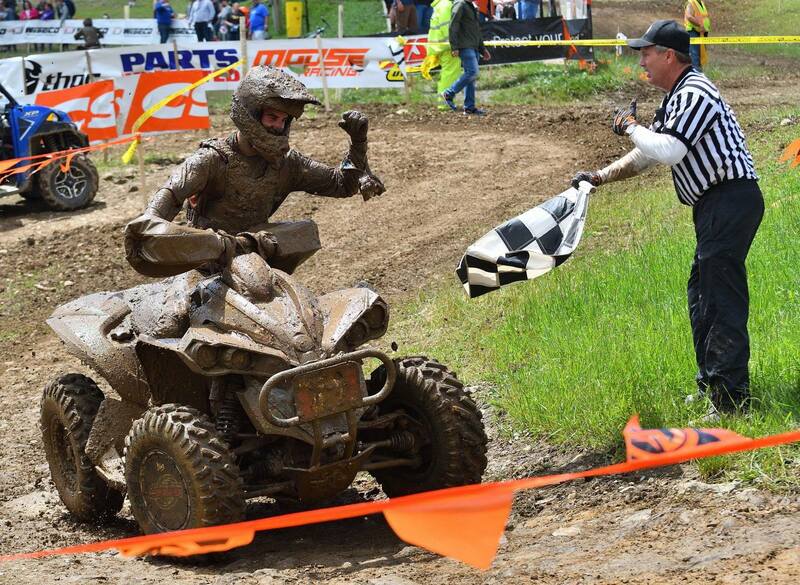 Can-Am ATV racers won five classes at the Snowshoe Grand National Cross Country (GNCC) series in West Virginia. ATV racing legend and Can-Am Maverick X3 side-by-side vehicle racer Tim Farr won Sunday in horribly muddy conditions, while fellow Can-Am pilot Kyle Chaney earned the victory Saturday. In all, Can-Am Maverick X3 side-by-side vehicle racers led the way in Show Me State, earning two class wins and tallying six total podium spots, once again showcasing the vehicle’s superior design no matter the conditions. After two solid rounds and another podium finish, Can-Am driver Corry Weller left the track as the Turbo Production UTV class points leader. Round four of the series pitted many racing regulars against some new Midwest pilots in perfect conditions. Farr (FRE / Bak40 Motorsports / Can-Am) jumped out to an early lead on lap one, in front of three other Can-Am racers. Farr held the lead for the first three laps before Chaney (XPS Oils / Fox Racing Shox / Can-Am) overtook him on lap four and then ran out front until Weller started challenging him for the lead. Weller actually put her No. 748 DragonFire Racing / Maxxis / Can-Am Maverick X3 race vehicle ahead of Chaney’s Can-Am late in lap five, but Chaney answered quickly by retaking the lead at the midway point. After the restart lap (lap six), Chaney stayed out front and didn’t look back, notching the win and earning the fastest lap award in his No. 91 Can-Am Maverick X3 side-by-side vehicle. Weller captured third place, just behind teammate and fellow Can-Am Maverick X3 pilot Paul O’Brien, who stormed back from outside the top five to earn second in his No. #711 Weller Racing / Specialty Coatings / Can-Am. That gave Can-Am a 1-2-3 podium finish at round four and kept O’Brien in the class points lead at that point. The Turbo UTV feature, delayed 2 hours due to weather, began in heavy rain, turning the already wet course into a short-course bog, so to speak. However, the Can-Am racers and Maverick X3 side-by-side vehicle were confident in their skills and vehicles in spite of the dismal conditions. Farr got out front early, using his driving expertise and the performance of his turbocharged Can-Am side-by-side vehicle. Chaney waited until the white flag lap to make his passing attempts on the leader, but could not find his way to the front, as Farr took the win. Chaney earned the fastest lap award and his second podium of the weekend. Another Can-Am racer, Kyle Hart, ended up third. Weller survived the muck, too, to capture fifth place, which pushed her into the class points lead after five rounds of competition, a few points in front of O’Brien, who was sixth. “I’m in good company with my teammate Paul O’Brien in the battle for the LOORRS championship,” stated Weller. “[We have] good momentum going into the next round. Can-Am 4×4 ATV racers had a great showing at round nine of the 2018 GNCC ATV series, winning five classes and earning a total of 14 of a possible 18 podium positions in various classes. Landon Wolfe (Can-Am / DeRisi Racing / GBC Motorsports) led the way aboard his Can-Am Renegade X xc 1000R with his second-straight victory in the 4×4 Pro ATV ranks. Wolfe had six consecutive runner-up finishes prior to starting his winning streak. Reigning two-time 4×4 Pro ATV class champion and Can-Am Renegade racer Kevin Cunningham finish roughly five seconds behind to record his ninth podium of the year. His second-place run also kept his class points lead at 40 as the GNCC season takes its mid-summer break until mid-September. Can-Am ATV racers also produced class podium sweeps in both the 4×4 A and 4×4 B and notched wins in the 4×4 C and 4×4 Lites classes during another dominant showing. For more information about Can-Am off-road products, the family of championship-winning Can-Am Maverick X3 side-by- side vehicles, the new Can-Am Renegade ATVs and the Can-Am racing program, visit CanAmOffRoad.com. BRP (TSX: DOO) is a global leader in the design, development, manufacturing, distribution and marketing of powersports vehicles and propulsion systems. Its portfolio includes Ski-Doo and Lynx snowmobiles, Sea-Doo watercraft, Can-Am off-road and Spyder vehicles, Evinrude and Rotax marine propulsion systems as well as Rotax engines for karts, motorcycles and recreational aircraft. BRP supports its line of products with a dedicated parts, accessories and clothing business. With annual sales of CA$4.2 billion from over 100 countries, the Company employs approximately 8,700 people worldwide.